The really brief review of the new film from In Bruges writer/director Martin McDonagh, Seven Psychopaths would be: Trust me, go see it. The not quite so brief review would be: This is a clever, sharp, intriguing film you will thoroughly enjoy. Go see it. But neither would be fair. Seven Psychopaths is a large ensemble cast performing at the top of their game, in a story that pokes fun at Hollywood while not having that “insider” feel that some films lampooning the film industry often contain. “Marty” (Colin Farell) is a screenwriter who drinks too much, mistreats the woman he’s involved with (Abbie Cornish), and has a great title for a screenplay. 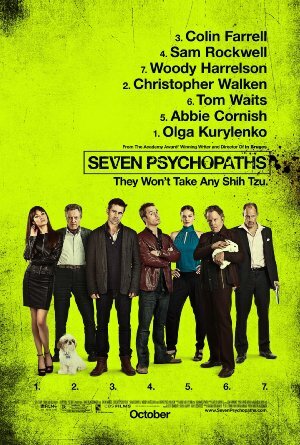 But aside from the title, Seven Psychopaths, he has little else in terms of ideas or characters. His good friend “Billy” (Sam Rockwell), who is an actor that doesn’t work as a waiter or barista, wants to help. Billy has suggestions of psychopaths that Marty can use in the project and actually wants to co-write the screenplay. That’s an idea that Marty isn’t comfortable with, but he is willing to listen to Billy’s ideas. Billy supports himself with a dognapping business he runs with “Hans” (Christopher Walken). Walken is not focused on business at the moment because his wife “Myra” (Linda Bright Clay) is sick and may be dying. But the business pretty much runs itself. Take a person’s dog when they aren’t looking and hang onto the dog until the owner posts a reward. Then one of them returns the dog and collects the reward. The problems start when they take the ShihTzu that belongs to “Charlie” (Woody Harrelson), a crime boss with problems. He’s upset with his girlfriend “Angela” (Olga Kurylenko) and orders two of his thugs to kill her. But they are killed themselves by a psychopathic killer known as the “Jack of Diamonds” (because he leaves that card with every one of his victims. Stranger still is that all of his victims are members of crime gangs. This leads to Charlie and his remaining thugs searching to locate the dognappers and recover his “Bonny”, while Marty and Billy try to flesh out this screenplay idea. Seven Psychopaths is multi-layered and McDonagh peels those layers back like they were the thinnest sections of an onion. One by one, the layers are revealed beneath one another until all is revealed and the final confrontations take place. The actors are terrific. Great dialogue and characters with subtext allow them to perform without having to reach over the top to make themselves heard. The story sags in places, and sometimes the dialogue is almost too hip for the room. But those moments are rare enough that they don’t really detract from the experience.